We were due to leave our flat on Sunday, after having emptied it of all belongings. At the same time, the final utilities bill was paid, and the electricity and water were due to be disconnected. The remaining items – bed, fridge, cooker etc were to be collected throughout the day and evening. We planned to stay in the Movenpick Hotel for our last three days in Qatar, however Sunday was a day before our check-in and we needed a bed of the night, and had to be near the flat so that we were available when things were collected. A good friend who lived five floors beneath us kindly offered us his bed for the night. He was the first person I got to know when I first arrived in Doha. He was full of advice and practical help, which made acclimatising to the idiosyncracies of Qatar life so much easier. Our friend is Syrian, from a country he cannot safely return to, and if he could to a house that has been destroyed in the war. He is one of a number of Syrians I have met here. Whilst, of course, we were not homeless, we were charitably given somewhere to stay for one night, unlike the millions of his fellow countrymen who are seeking refuge in safer parts of the world. What is needed is a little bit more of the kindness and generosity of our Syrian friend from western people and nations. 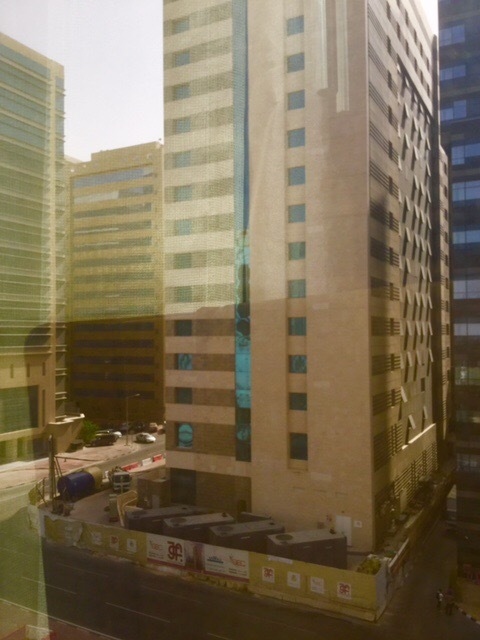 When I arrived in Doha in 2012, the hotel being built opposite my hotel window was a shell of around ten floors. Four years later it is still not finished. We have now left our apartment. For our last few days in Qatar, we will be staying in the Movenpick Hotel. By amazing coincidence, we are in the exact same room that I stayed in when I arrived in Doha nearly 4 years ago. This week, we shipped our worldly goods back to the UK. They weighed 336 kilograms, made up mainly of an assortment of domestic items and clothing. I had spent the previous few weeks gradually packing away things that were no longer needed into cardboard boxes. The flat is now almost empty, with only the bed, a couple of chairs, cooker and fridge. These will be going tomorrow. We had quotes from several local businesses, eventually selecting Emovers to ship our possessions back to the UK. They defied the usual standards of customer service in Qatar, by providing clear quotations, all the information we needed, replying to emails by return, and by arriving on the agreed day and at the agreed time. They then worked efficiently and quickly to ensure the boxes were correctly sealed, weighed and the inventory of contents of each box recorded . Within two hours everything was gone, heading off to the cargo centre at the airport. It is important to provide the correct shipping documentation, which is a QID (not a copy), a passport copy, and an NOC from your employer which generously permits you to export your own belongings out of Qatar. If you are leaving Qatar, I can recommend Emovers.